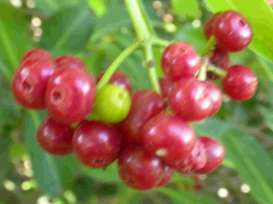 Bulbuls, robins and barbets are a few of the locals spotted dining at the black bird-berry, with its attractive glossy foliage and showy red and yellow berries. 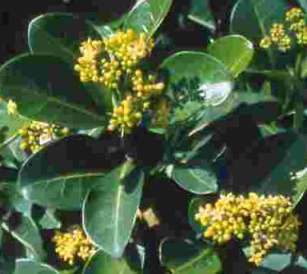 Psychotria capensis is an evergreen shrub or small tree, 3-8 m tall, with a slender stem, horizontal branches and pale brown bark. The leaves are shiny, light to dark green above and paler below, smooth and leathery; they are fairly large, 70-150 x 15-60 mm, elliptic to obovate, opposite and often drooping. Golden yellow flowers are borne in flattish, terminal, branched heads up to 80 mm in diameter from spring to midsummer (August to January). The flowers are followed in late summer to winter (January to July) by large, flat clusters of pea-sized, shiny yellow fruits ripening to red or black. Psychotria capensis is found on the eastern side of the country from Knysna through the Eastern Cape and KwaZulu-Natal to Mpumalanga, Limpopo, southern Mozambique and Zimbabwe. Its natural habitat ranges from sea level to 1 500 m in evergreen forests, forest margins, shrub and dune bush, edges of rivers and rocky outcrops in high-rainfall grassland. Psychotria is Greek for vivifying, meaning to give or endow with life and refers to the several supposed healing properties of some species; capensis means of the Cape. There are about 1 400 species occurring in warm tropical regions of both hemispheres; however, only two species occur in southern Africa. P. capensis and P. zombamontana, a rare species found in Limpopo and Mpumalanga. It is easy to distinguish from P. capensis as its leaves are ovate, often acuminate (taper to a long narrow point) with more lateral veins, its flowers white and the fruit ribbed. Birds such as the Blackeyed and Yellowbellied bulbuls, Redwinged starlings, robins and barbets find the berries irresistible. The wood is hard and fine-grained, making a good general purpose timber. It is yellowish brown in colour and has a beautiful finish when varnished. Medicinally P. capensis is used for gastric complaints and root infusions are taken to cause vomiting. In the Amazon, many species of Psychotria are used by shamans and indigenous people for a variety of medicinal purposes. In Peru, Ecuador, Colombia and Brazil, the leaves of P. viridis and P. carthaginensis are commonly prepared with ayahuasca ( Banisteriopsis caapi ), to make the ceremonial visionary healing medicine ayahuasca. This very decorative shrub is a must for all frost-free gardens. Not only is it a year-round attraction, either in fruit or flower most the time, it is also easy to grow. 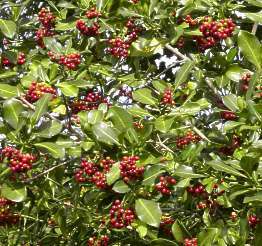 Growing equally well in sun or shade, it is perfect for those difficult, summer-shade winter-sun spots under large trees. Plant in groups or repeat plants throughout the bed. Given a thick layer of mulch it will grow in any soil and only requires additional watering in summer and in dry conditions. Although Psychotria capensis seems to thrive under warm, moist conditions, it can be grown in colder regions in protected positions. It is also successfully grown in containers on balconies and patios. Psychotria capensis is both quick and easy to grow from seed. Just remove the flesh from around the stone of ripe fruits and sow in spring. Seed is available from the Kirstenbosch Seed Room. Hutchings, A. 1996. Zulu medicinal plants . University of Natal Press, Scottsville. Jackson, W.P.U. 1990. Origins and meanings of names of South African plant genera. University of Cape Town, Cape Town. Pooley, E. 1993. The complete field guide to trees of Natal, Zululand and Transkei . Natal Flora Publications Trust, Durban. Van Wyk, B. & Van Wyk, P. 1997. Field guide to trees of southern Africa . Struik, Cape Town. Von Breitenbach, J., De Winter, B., Poynton, R., Van den Berg, E., Van Wyk, B. & Van Wyk, E. 2001. Pocket list of southern African indigenous trees. Briza Publications, Pretoria.